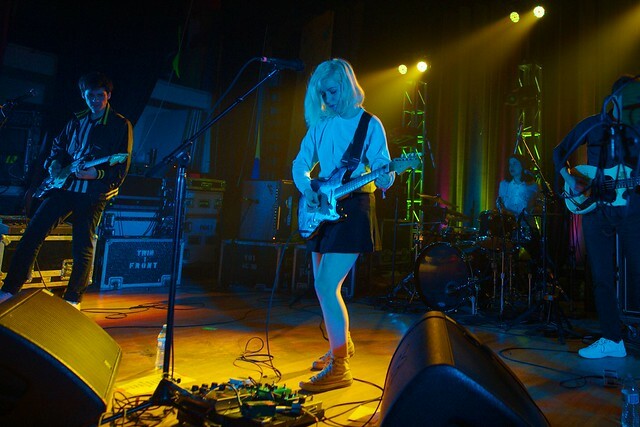 Alvvays lit up the Rock and Roll Hotel with waves of luminous and crowd-pleasing dream pop on Saturday, October 7th. Coming to us all the way from Toronto, Ontario, Alvvays (pronounced Always), gifted the sold out crowd with 17 head nodding songs. They liken their sound to The Cranberries if pressed; some may say dream pop, others jangle pop. Still others may find the desire to categorize tedious. The five members of the band spread out before a giant white screen with looping video and images, while the lights changed with the mood of the songs and the riffs, from blues to reds to yellows. The colors were as powerful and representative of each song as the lyrics and the music. Alvvays released their second album, Antisocialites, in September. They spent a lot of time performing the newer songs, giving us a chance to hear almost the entire album (skipping just one song of 10), and really driving home nine reasons to acquire it at all costs. For example, early in the show they played “In Undertow”, an atmospheric break-up song, while “Plimsoll Punks” is a frothy take down of a fake, annoying person. One of the highlights of the show was “Lollipop (Ode to Jim)”, an immersive blue-colored, bubblegummy track that made everyone happy to be there. The twisting yellow/white “Hey” is a bouncy, almost psychedelic peek at not sticking it out when things get tough. Alvvays is Molly Rankin (lead vocals, guitar), with Kerri MacLellan (farfisa, nerd glasses), Alec O’Hanley (guitar), Brian Murphy (bass), and new to the band, Sheridan Riley (drums). At one point, they asked for anyone to tell a joke, and one band member shot back, ‘The president is the Apprentice dude!’ to which Molly quipped, ‘Hubba Hubba’ to the amiable groans of the audience. Near the end of the main set, Molly gave a shout out to the fans in the back and played “Archie, Marry Me”, which was the correct thing to do since everyone went crazy enough to want to sing-along. They closed the main set with their sprightly single “Party Police” with the refrain, ‘You don’t have to leave, you could just stay here with me.’ They did have to leave, for a brief beat before bounding back for a well-received encore. For the last song of the encore, Molly asked the happy crowd if they wanted a slow song or “The Agency Group”. It was no contest, and they ended with a head nodding flourish. Alvvays played to two sold out shows at the Rock and Roll Hotel, so next time they visit DC, don’t sleep on getting your tickets because at no point will you regret your decision.